In my blog article of 30 November this year titled NEHGS: Royal Roots Run Deep for Meghan Markle, I mentioned Christopher C. Child's article The Wentworth Connection in NEHGS' blog Vita Brevis. I am sure there will be more articles – and maybe also a book? – covering Meghan Markle's ancestry and other genealogical connections as we get closer to the wedding. 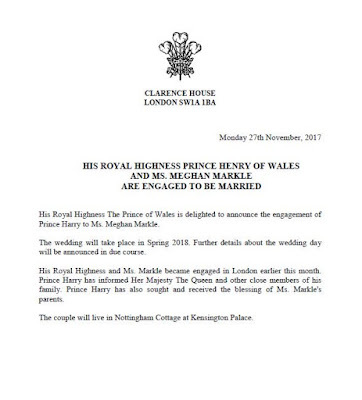 The engagement of Prince Henry («Harry») of Wales, youngest son of the Prince of Wales and the late Diana, Princess of Wales, and the American-born actress Meghan Markle, was announced on 27 November 2017. The wedding will take place at St. George's Chapel at Windsor on 19 May 2018, Kensington Palace announced on 15 December. Six days later three official photographs to mark their engagement were released. The photos can be viewed here, here as well as here! While the editorial is dedicated to Queen Elizabeth II and Prince Philip of the United Kingdom, who celebrated their platinum wedding earlier this year, the front page is dedicated to Denmark and Queen Alexandrine, here sitting together with her grandchildren (from left to right) Princesses Benedikte, Margrethe, Anne-Marie and Elizabeth and Princes Christian and Ingolf. The cover photo tells that inside the magazine the readers are treated with the third and last part of Charlotte Zeepwat's The Royal House of Denmark – A Family Album. Besides the introduction the article offers as many as 92 illustrations as well as two pages with genealogical tables. And if this is not enough, there is yet another Danish-connected article further back in the issue, as Princess Thyra (1880–1945), the younger sister of King Christian X of Denmark and King Haakon VII of Norway, appears in the series Little-Known Royals, with Coryne Hall as the author. My favourite article of this issue, however, is written by Joseph van Loon and Oliver Defrance and titled The Last Kohary. The life of Prince Phillipp Josias of Saxe-Coburg and Gotha. I learnt a lot about the Coburg-Kohary Trust and the prince in particular. More of this, please! 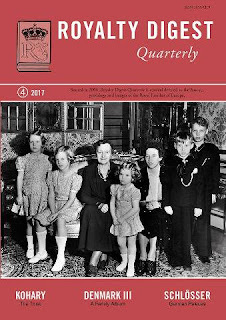 The documents the late John Wimbles collected from the Romanian National Archives and other sources seem to have no end, fortunately, and in the latest issue of RDQ the readers can enjoy the 6th part of the series Half a Century of Royal Letters; 1899–1947. Susan Symons has now written four books on German palaces – Schloss: The Fascinating Royal History of 25 German Castles (2014), Schloss II: More Fascinating Royal History of German Castles (2015), Schloss III: The Fascinating Royal History of 25 Castles in Central Germany (2016) and finally Schloss in Bavaria: The Fascinating Royal History of German Castles (2017). I own the two first volumes, so not only do I need to get hold of the last two books, but I realize that there are so many interesting palaces in Germany I need to visit! In the article My favourite 'Schlösser', Symons lists her top ten facourites. I have only been to two of her favourites – Hohenschwangau and Berchtesgaden. I don't think I was ever inside the palace in Berchtesgaden, so I guess it shouldn't been counted. Symons is, by the way, also the author of three books on the life of Queen Victoria: Young Victoria (2016), Victoria & Albert (2016) and Victoria the Widowed Queen (2017). Quite a production during such a short period of time! 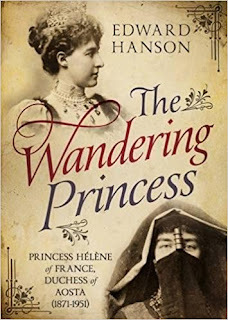 After the German palaces, Charlotte Zeepvat returns with her second article, this time a review of Edward Hansons book The Wandering Princess. Princess Hélène of France, Duchess of Aosta (1871–1951), Stroud: Fonthill Media, 2017. ISBN 978-1781555927. In the final column The World Wide Web of Royalty, the readers can find genealogical news from the Imperial, Royal and/or Princely houses of Bourbon-Orléans, Brazil, Erbach-Fürstenau, Hannover, Leiningen/Prussia, Liechtenstein, Romania and Saxe-Coburg and Gotha. Concerning Romania, we learn that the editior will return with the obituary of King Michael in the next issue of Royalty Digest Quarterly. Trond Norén Isaksen has also written an obituary which was printed in the January 2018 issue of Majesty, which now should be available both in print and in electronic form. This December month has been rather busy due to Christmas preparations and work load, and I have not been able to write about the various events as I had wanted to. Here is a summary of the events I wish to write about. 1 December 2017: The christening of Prince Gabriel, second son of Prince Carl Philip and Princess Sofia, took place in the Royal Chapel at Drottningholm Palace outside Stockholm. The christening was officiated by Archbishop emeritus Anders Wejryd, assisted by Bishop and Chief Court Chaplain Johan Dalman and Court Chaplain and Rector of the Royal Court Parish Michael Bjerkhagen. Normally the christening would have been officiated by Archbishop Antje Jackelén, but she had obligations abroad. Prince Gabriel's sponsors were Princess Madeleine, Sara Hellqvist (one of Princess Sofia's sisters), Oscar Kylberg (friend and business partner of Prince Carl Philip), Carolina Pihl (friend and business partner of Princess Sofia) and Thomas de Toledo Sommerlath (cousin of Prince Carl Philip). Guests attending the christening ceremony and the reception can be viewed here. 5 December 2017: In the case between Prince Louis of Luxembourg, Princess Tessy of Luxembourg and The Telegraph Media Group Ltd., the England and Wales High Court ruled that details of the former royal couple's financial matters as well as details of their divorce settlement were not allowed to be published. The explanatory note to the court decision said: «1. The Applicant Husband and the Respondent wife are engaged in financial remedy proceedings before the High Court of England and Wales. Those proceedings are ongoing. 2. The purpose of this order is to seek to protect the confidentiality of the parties' financial arrangements and their negotiations within the context of their financial remedy proceedings, pending resolution of the same by agreement or determination of the court. 3. In the circumstances, the court has ordered that the matters set out at Paragraph 6 of this order shall not be published pending the conclusion of the financial remedy proceedings between the parties.» Prince Louis and Princess Tessy, who were married in 2006 and have two sons together, broke up in the summer of 2016 and a decree nisi was granted om 17 February 2017. 5 December 2017: King Michael died in his residence in Arbonne, Switzerland, 96 years old. King Michael was King of Romania twice, from 1927 to 1930 and again from 1940 until his abdication was forced upon him by the communist regime in late 1947 and he was forced into exile. He earned his people's respect and popularity especially for, when he felt his position was strong enough, launched a coup d'etat against the fascist dictator Ion Antonescu and brought Romania over to the allied countries. Then king was awarded the Legion of Merit in 1946. The citation can be read here. After the communist regime fell in 1989, the was on several occasions refused entry to his homeland, but in 1997 his citizenship was restored and he was allowed to visit Romania again. King Michael was married to Princess Anne of Bourbon-Parme (1923–2016) in Athens, Greece and had 5 daughters. I had the pleasure of meeting both King Michael and Queen Anne as well as their daughter Princess Margarita and her husband Radu Duda during their visit to Oslo in 1997. A man of principles, King Michael for a long time felt loyal to the last monarchist constitition of 1923, which stipulated agnatic succession and in case of the lack of a male heir, the succession would revert to the House of Hohenzollern. However, in 2007 King Michael changed his mind and signed a document named the Fundamental Rules of the Royal Family of Romania, by which he designated his eldest daughter Princess Margareta as his heir. No-one would doubt that Princess Margarita would be his heir if Romania had restored the monarchical form of government. The question many monarchists and royal watchers ask is if the king should personally decide on the order of succession and include and exclude members as he saw fit. Normally succession questions are a state affair, not the king's personal toy. The last ten years of his life was partly shadowed by scandals within his family, and his own handling of the succession question and treatment of his grandson Nicholas de Roumanie-Medforth-Mills has received critical comments. Concerning the fundamental rules, The Telegraph in its obituary wrote that «As Romania is now a republic with a president, the document has no legal standing.» That is of course correct as of now. However, the Parliament of Romania is currently considering to pass a law giving the royal family a special status and by which the fundamental rules would be acknowledged. In her declaration to the Romanian people Princess Margarita referred to herself as «Custodian of the Crown of Romania». 15 December 2017: The remains of Queen Elena of Italy (1873–1952) were brought from Montpellier, France to the family mausoleum at the Sanctuary of Vicoforte in northern Italy. Two days later the remains of her husband King Vittorio Emanuele III (b1869–r1900–1946–d1947) were transferred from Egypt. Parts of the royal family had wanted the former king to be buried in the Pantheon in Rome, but this was refused by the authorities. 16 December 2017: The funeral service for King Michael took place in Romania. The program can be read at the official website of the royal family. 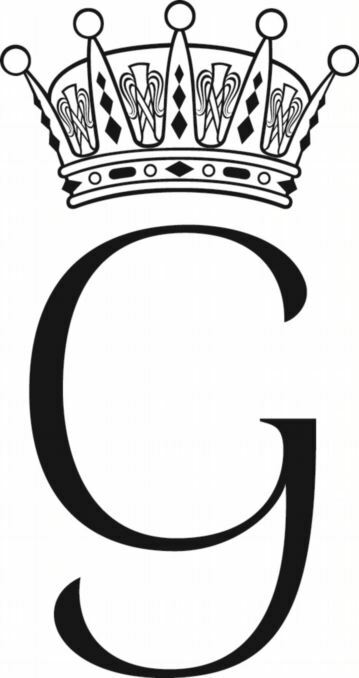 The list of representatives of reigning and former reigning royal families can be read here. The courts of Norway, the Netherlands, Denmark and Monaco did not send any representatives. Concerning Norway, the main reason for the absence of representation, other than that there has – as far as I understand it – been little contact between the two families over the years, was that the king was to attend the consecration of Kari Veiteberg, the new Bishop of the bishopric of Oslo at 11 a.m. on Sunday 17 December, and he would not have made it back in time for that event if he had gone to Romania. The Crown Prince could of course have attended. 18 December 2017: According to the newspaper Romania Insider, «Romania’s governing parties ponder referendum on constitutional monarchy». 24 December 2017: The King and Queen of Norway celebrated Christmas at Kongsseteren («the Royal Lodge») in Oslo together with Princess Märtha Louise, Ari Behn and their daughters, while the Crown Prince family spent Christmas at Skaugum in Asker. Ari Behn, who is on good terms with his former in-laws after his marriage to Princess Märtha Louise broke down in 2016, commented in an interview earlier this month: «I am still part of the family». In an interview with TV2, Behn said: «This will be Christmas no. 2 in my new situation. Last year the children were with me, so this will be the first Christmas with the royal family after the divorce». On 5 August 2016 the Norwegian Royal Court announced that Princess Märtha Louise and Ari Behn were going to divorce. The court did not reveal when the formal separation took place. According to the Norwegian marriage act section 21, «Each of the spouses may demand a divorce when they have been separated for at least one year.» This would mean that the divorce was granted some time in 2017, but the royal court has not stated exactly when the royal marriage was finally dissolved. 25 December 2017: King Harald, Queen Sonja, Princess Märtha Louise and her two youngest daughters attended church service at Holmenkollen Chapel. The Crown Prince family attended the Christmas service in Asker Church the day before. Updated on Thursday 28 December 2017 at 07.50 (I had for some reason forgotten to write King Vittorio Emanuele's numeral!). Meghan Markle, whose engagement to Prince Harry of Wales was announced earlier this week, has deep royal roots according to an article the New England Historic Genealogical Society published today. Earlier this week I asked the genealogical society on Twitter if there was «Any chance of a book on Meghan Markle's ancestry like Reitwiesner/Child did with the former Catherine Middleton?» So far NEHGS has responded by clicking on the like button. But maybe a more detailed account of Meghan Markle's ancestry will be published closer to the wedding? Having said that, I hope that the genealogist Gary Boyd Roberts, who is a Senior Research Scholar Emeritus at the New England Historic Genealogical Society (NEHGS), will return with more details about the sources for his claims made in the article mentioned above. His short entry about Ms. Markle's ancestry can be viewed here. Postscript 30 November 2017 at 22.10: Christopher C. Child has just published the article The Wentworth Connection in NEHGS' blog Vita Brevis. Child gives more details with references to published books and has also provided a chart which shows one of the many connections between Ms. Markle and Prince Harry. Child also writes: «I’ve also been working on Meghan Markle’s American ancestors, so stay tuned!» So there is maybe hope for something more on Meghan's ancestry some time in the future? Updated on 30 November 2017 at 22.10 (link to Roberts' entry and the postscript were added), last time on Monday 4 December 2017 at 12.50 (typos corrected). Only one day after the engagement between Prince Harry of Wales and Meghan Markle was announced, Kensington Palace could reveal that the wedding is going to take place in St. George's Chapel at Windsor Castle in May 2018. The press release also said that the royal family would pay for the wedding. More details to follow in due course. St. George's Chapel is, among others, where the Prince of Wales and the Duchess of Cornwall received their blessings after their civil marriage, and where Prince Edward, Earl of Wessex, married Sophie Rhys-Jones in 1999. The christening of Prince Harry also took place in the chapel on 21 December 1984. Kensington Palace also informed today that Prince Harry and Ms. Markle would undertake their first official engagements together in Nottingham firstcoming Friday, 1 December. They are going to visit a Terrence Higgins Trust charity fair where they will meet representatives of organisations supporting people living with HIV/AIDS. They will also speak to staff and mentors at Nottingham Academy «about the Full Effect programme which is helping prevent young people from turning to violence and crime». The Telegraph, on the other hand, writes that «Ms Markle, a protestant who went to a Catholic high school, will be both baptised and confirmed ready for the religious ceremony. She also intends to become a British citizen.» The New York Times follows up by telling that «Ms. Markle, a Protestant, was not baptized as a child. She attended a Catholic girls’ school in Los Angeles.» But if she was not baptized as a child, but still referred to as a protestant, one could easily wonder what kind of protestant church her family, or parts thereof, belongs to, and what kind of relationship she has had with it. I suppose more information will appear in due course. Postscript 29 November 2017 at 21.00: Daily Mail, and surely other newspapers as well, writes today that «Miss Markle, whose father is an Episcopalian, will be baptised and confirmed in the Church of England before the wedding». No word on Meghan's mother's church affilation, if any. I should add that QVD author Marlene Koenig wrote already in August that Thomas Markle was an Episcopalian. Updated on Tuesday 28 November 2017 at 20.10 (paragraph about baptism and citizenship added), last time on Wednesday 29 November 2017 at 21.00 (postscript added). His Royal Highness The Prince of Wales is delighted to announce the engagement of Prince Henry to Ms. Methan Markle. His Royal Highness and Ms. Markle became engaged in London earlier this month. Prince Harry has informed Her Majesty The Queen and other close members of his family. Prince Harry has also sought and received the blessing of Ms. Markle's parents. «We are incredibly happy for Meghan and Harry. Our daughter has always been a kind and loving person. To see her union with Harry, who shares the same qualities, is a source of great joy for us as parents. The Queen and The Duke of Edinburgh are delighted for the couple and wish them every happiness. I would like to offer my very warmest congratulations to HRH Prince Harry and Meghan Markle upon their engagement. This is a time of huge celebration for two people in love and, on behalf of myself, the Government and the country, I wish them great happiness for the future. Considering the fact that Meghan Markle is an American citizen one could perhaps have expected a statement from the White House as well, but I guess that will come later. The newly engaged couple met the media for a photo call in Kensington Palace Gardens at 2 p.m. today. Four hours later the couple appeared in a broadcast interview. I was most impressed by them both. They seemed to be very much in love and appeared confident and sure of each other as a couple. From different backgrounds, yes, but still seem to be a good match. Yes, she is an actress and has some experience with the media, but still it was great to see how well she handled the interview situation. She will be a great asset to the British Royal Family I am sure. Meghan Markle was born in Los Angeles, California, USA on 4 August 1981. Meghan has one half-brother, Tom, and one half-sister, Samantha. She went among others to the Catholic Immaculate Heart High School. In 2003 she graduated from Northwestern University in Chicago, where she took theater studies before completing her bachelor's degree in theater and international studies. As an actress she is best known for her role as Rachel Zane in the legal drama series Suits. She has also been involved with charity work and is an advocate for women's issues. She was married to Trevor Engelson from 2011 to 2013. A summary of Ms. Markle's ancestry can be read in the current version of the Wikipedia article about her. Ms. Markle - an American, an actress, a divorcee and biracial. In late 2016 Elle Magazine republished an article Meghan Markle wrote in July 2015, titled I'm More Than An 'Other', "on creating her identity and finding her voice as a mixed race woman. Personally I don't think the colour of her skin is much an issue in the United Kingdom. She will be welcomed with open arms. Only a minority would have an issue with her former marriage. Her parents are divorced and she has been through a short marrige herself. This might be a bit worrysome, but every relationship is different. They have both been through long relationships and have hopefully learnt by their mistakes. I have a good feeling for their marriage. HM The Queen has given her blessings. In accordance with the Succession to the Crown Act 2013, as Prince Harry is currently number five in the line of succession to the British throne, the Queen will also formally have to give her consent in a Privy Council meeting. Most likely the Queen will also bestow upon Prince Harry a ducal title. As of today the title Duke of Sussex seems to the greatest favourite. If he receives such a ducal title, Meghan Markle will have the status as a Princess of the United Kingdom of Great Britain and Northern Ireland due to her marriage to a Prince, but will be styled HRH The Duchess of Sussex. In accordance with the Letters Patent of George V (1917) any children of Harry and Meghan will not be princes or princesses with the style Royal Highness unless the Queen decides to «upgrade them», as the editor of Peerage News, Michael Rhodes, put it earlier today. This is what happened in 2013 when the Queen issued a Letters Patent where she declared that «all the children of the eldest son of The Prince of Wales should have and enjoy the style, title and attribute of Royal Highness with the titular dignity of Prince or Princess prefixed to their Christian names or with such other titles of honour.» She just has to issue another Letters Patent where the words «eldest son of The Prince of Wales» are replaced by «youngest son of The Prince of Wales». Updated on Tuesday 28 November 2017 at 08.40 (minor addition, some typos corrected). 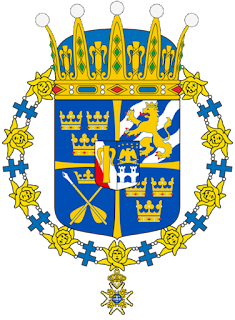 The National Archives of Sweden published today the arms of Prince Gabriel of Sweden, whose christening will take place on 1 December. The arms were presented at the meeting of the Heraldic Committee of the National Archives on 24 October 2017. The four quarters of the arms show the lesser coat of arms of Sweden (field 1 and 4), the arms of Folkunga (field 2) and in field 3 the arms of Dalarna. As previously mentioned, Prince Gabriel was also given the title of Duke of Dalarna at the Council of State held at Stockholm Palace on 4 September 2017. The inescutcheon shows the arms of the House of Bernadotte.The arms are then crowned by the Swedish prince crown. Prince Gabriel will receive the Order of the Seraphim in connection with the christening, which explains why the arms are encircled (in lack of the correct heraldic term) by the collar and badge of the said order. The arms are drawn by the heraldic artist Henrik Dahlström, the Swedish National Archives. Blazon: "Azure, two Dalecarlian Arrows Or in saltire point upwards pointed Argent and in chief a Crown of the first". Source: Wikipedia. The monogram consists of the initial G and a prince crown above and is drawn by the heraldic artist Vladimir A Sagerlund. King Harald of Norway was today discharged from the National Hospital (Rikshospitalet) and is in good shape, the Norwegian Royal Court announced today. The king was admitted to hospital on Friday due to an infection. The Norwegian Royal Court announced today that King Harald (80) was hospitalised on Friday 17 September 2017 after having contracted an infection. His condition is described as satisfactory, and is improving. Hans Majestet Kongen ble fredag innlagt på Rikshospitalet i Oslo på grunn av en infeksjon. Tilstanden er tilfredsstillende, og Kongen er i bedring. The Norwegain daily VG.no writes today that the king's planned engagements on Monday have been cancelled. He was scheduled to receive in audience the Chief of the Royal Norwegian Navy, Rear Admiral Nils Andreas Stensønes, as well as representatives of the National Spiritual Council for Bahá'í in Norway. In addition he was to receive in audience Brigadier General Jan Morten Mangersnes and the chairperson of the Norwegian Nobel Committee, Berit Reiss-Andersen. According to the Royal Court the king presided in Council of State on Friday at 11 a.m., so the hospitalisation must have taken place later in the day. Det er gitt plass til to anmeldelser denne gangen. Are S. Gustavsen har gitt sine inntrykk av Rune Nedruds tobindsverk Sikt og sakefall 1612-1695 for Hadeland, Toten, Vardal, Biri, Valdres og Land, utgitt 2016, og Sikt og sakefall 1606-1695 for Gudbrandsdalen, utgitt i 2017, i artikkelen «Opplysende om livets mange skyggesider», mens undertegnede har gitt en presentasjon av The Central Iowa Norwegian Project og anmeldt første bind av Arlen Twedts The Central Iowa Norwegians, utgitt i 2017. Videre inneholder Genealogen foreningsstoff slik som et medlemsblad skal ha, slik som protokoll fra årsmøtet 2017 og en oversikt over donerte bøker til NSFs bibliotek fra oktober 2016 til oktober 2017. Mitt hovedbidrag denne gangen er altså artikkelen Mer om Rosenbaum og Rogg. Kanskje ikke den mest prosaiske tittelen, men den indikerer i hvert fall at jeg har fulgt opp artikkelen Rosenbaum som tok slektsnavnet Rogg, som ble publisert i Genealogen nr. 1, 2017. Artikkelen omhandlet brødrene Halvard, Karl Marius «Kalle» og Henry Conrad Rosenbaum, som i 1939 fikk Justisdepartementets bevilling til å anta slektsnavnet Rogg. I artikkelen skrev jeg litt om navnebevillinger som kilde og litt om hva som motiverte brødrenes ønske om å skifte slektsnavn. I tillegg ga jeg en presentasjon av de tre brødrene og inkluderte samtidig en kort genealogisk oversikt over de tre brødrene og deres nærmeste slektskrets, som inkluderte to halvsøstre, en antatt halvbror samt brødrenes foreldre Henry Conrad Rosenbaum (d.e.) (1878–1949) og Harriet Rosenbaum, f. Kristensen (1881–1965). Jeg kom ikke helt i mål med genealogien – det var fortsatt noen uavklarte spørsmål som stod igjen ved deadline. Det skyldtes delvis at jeg kom litt for sent i gang med prosjektet – det var jo navnebevillingen jeg først og fremst hadde tenkt å fokusere på – og delvis at jeg ikke var kreativ nok i letingen etter kilder. Prosjektet ble også større enn jeg hadde opprinnelig planlagt. Etter at jeg leverte artikkelen, har jeg funnet ytterligere informasjon om slektskretsen, og som både utfyller og korrigerer artikkelen. Blant nyhetene er detaljer om farmoren og farmoren til Henry Conrad Rosenbaum (d.e. ), som ble født i Edinburgh og deretter etterlatt hos fosterforeldre i Norge mens foreldrene Adolf Rosenbaum, f. ca. 1853, angivelig i Hamburg, og Helle Johanne Nilsen (Nilsdatter), f. 1855 i Sande, emigrerte til USA. Jeg har ennå ikke funnet spor etter dem, så det får eventuelt bli et senere prosjekt. Men jeg kom endelig i mål med Henry Conrads datter med Anna Mathilde Ingebrigtsen, Magdalena Henriette Rosenbaum, som var født i Larvik i 1909, oppvokst i Tjølling og levde størsteparten av sitt voksne liv som gift og enke i Sandefjord, der hun døde i 1985. Underveis har jeg forsøkt å beskrive hvilke metoder jeg brukte for å komme frem til resultatet. Jeg sporet til slutt opp ett av Magdalenas barnebarn, som bidro med mange opplysninger. Jeg har dessverre ikke kommet til bunns i mysteriet om hvor det ble av Henry Odvar Rosenbaum, f. 1909, den antatte sønnen Henry Conrad Rosenbaum (d.e.) fikk med Olava Diderikke Stubberud (1876–1962). Men jeg har spor som jeg håper å kunne følge opp utover vinteren. Det fortelles for øvrig at Henry Conrad antagelig også ble far til et tredje utenomekteskapelig barn. Det er med andre ord mange tråder å nøste opp, men en spennende slekt å studere. Verken forrige eller herværende artikkel om Rosenbaum-Rogg-slekten gir en fullstendig oversikt over etterslekten. Det var heller aldri meningen. Men artiklene gir i hvert fall et godt utgangspunkt for videre studier. I tillegg er slektskretsen til Magdalena, med de mange halv- og stesøsknene i Holtan-slekten i Tjølling, også verdt å studere videre for de som vil ta utfordringen. Oppdatert onsdag 1. november 2017 kl. 13.20 (tyrkleif rettet opp). I received my copy of Royalty Digest Quarterly no. 3, 2017 at the end of September. It is on due time to give some of my impressions. 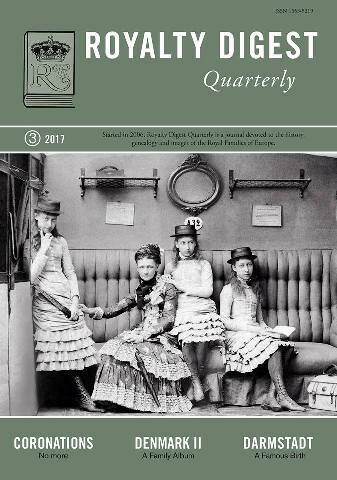 The photo on the front cover shows Queen Louise of Denmark (1817–1898) and her granddaughters Princesses Victoria, Maud and Louise of Wales. The photo was taken at Wiesbaden in 1882 according to the editor's photo caption on page 2. In his Editor's Corner Ted Rosvall is this time commenting on the names of Prince Carl Philip and Princess Sofia's second son Gabriel Carl Walther. Rosvall gives examples of other members of the Royal European Family who have the name Gabriel. He wrongly refers to Prince Louis of Luxembourg's son Gabriel, born 2006, as a Count of Nassau (and not Prince of Nassau, as he really is), but that is of course a trifle. There are many interesting articles in the present issue. The first one is titled The End of Swedish Coronations which is written by the historian Trond Norén Isaksen. He gives a detailed and well-sourced account for why the coronation ceremony was dropped after Gustaf V became King. The second article is written by the freelance journalist and historian Elizabeth Jane Timms and is titled Birth in Darmstadt – Princess Alix of Hesse. Princes Alix was the sixth child and fourth daughter of Prince Ludwig, later Grand Duke Ludwig IV (1837–1892), by his wife Princess Alice of the United Kingdom of Great Britain and Ireland (1843–1878). Princess Alix was of course later better known as Alexandra Feodorovna, Empress of Russia, spouse of Emperor Nicholas II. Everyone who has followed my blog which includes many articles about graves and cemeteries will not be surprised by how much I enjoyed Lucas Szkopinski's article The Final Resting Places of the Members of the Albanian Royal Family 1934–2012. Besides the historical outline of the short-lived Albanian monarchy and the members of the Albanian Royal Family, one will find photos of King Zog's original tomb at the Thiais cemetery outside Paris and the burial places in Tirana and Istanbul. Knowing that the remains of King Zog were about to be moved from France to Albania, I hurried to visit the Thiais cemetery in October 2009. I hope to visit Tirana some time later. Issue no. 3, 2017 brings the second part of The Royal House of Denmark – A Family Album by the periodical's historical consultant Charlotte Zeepvat. Besides the introduction, the readers are treated with 96 images and two pages with family tables. I suppose that the next issue will bring the third and final part of the family album covering Denmark. And wonder when it will be Norway's turn? Following the family album comes the obituary of Patricia Knatchbull, 2nd Countess Mountbatten of Burma (1924–2017), who died on 13 June this year. The obituary is written by Marlene A. Eilers Koenig, author of among others Queen Victoria's Descendants (1st edition, 1987; 2nd edition,1998; companion volume, 2004). Another ongoing serial in the RDQ is called Little-Known Royals. One can always discuss how little-known some of these royals are, but I guess I am not the right person to ask. Anyway, Coryne Hall has written a nice piece about Princess Katharina of Greece (1913–2007), later known as Lady Katherine Brandram. The father was born before the war in one of the German colonies and does not seem to have had quite a clear reputation in some business affairs. The mother is of a good (half French, half Luxembourg family, the best part of the family it seems) but the worst of all that could be, the mother of the father was a jewess. And that, of course, is a thing we could not get over. The said people were parents of a «Frl Essen», once the girl-friend of Princess Alexandra of Hohenlohe-Langenburg's son Prince Gottfried (1897–1960), who later married Princess Margarita of Greece (1905–1981). The present issue is concluded by the column The World Wide Web of Royalty, which brings genealogical news from the Royal, Princely and/or Ducal houses of Beaufort, Hannover, Oldenburg, Richmond, Ruffo and Sweden. Updated on 23 October 2017 at 10 a.m. (typo corrected). The Norwegian Royal Court announced today that the Duke and Duchess of Cambridge (William and Catherine) are coming to Norway for an official visit in early 2018. The exact date and program has not yet been set. According to a tweet from Kensington Palace earlier today, the couple is also going to visit Sweden. The tweet says that the couple will undetake the official visit «at the request of the FCO [Foreign & Commonwealth Office]». The Norwegian Royal Court confirmed today that Crown Prince Haakon will represent Norway at the funeral service and cremation ceremony for King Bhumibol Adulyadej (Rama IX) on 26 October 2017. The death of King Bhumibol on 13 October 2016 has been marked by a one-year period of mourning. From the 25th to the 29th of October several ceremonies will take place. The actual cremation will be held on 26 October 2017, with many royals and other dignitaries in attendance. More details can be found among others on the Bangkok Post's Royal Cremation Ceremony page and Wikipedia. Crown Prince Haakon will travel to Thailand alone. On the same day as the cremation ceremony takes place, his wife Crown Princess Mette-Marit will together with Princess Astrid Mrs. Ferner attend the gala dinner for the members of the Norwegian Parliament (Stortinget) hosted by King Harald and Queen Sonja. Her Excellency the Right Honourable Julie Payette, Governor General and Commander-in-Chief of Canada. Photo credit: Sgt Johanie Maheu, Rideau Hall © OSGG-BSGG, 2017. Julie Payette was today installed as Canada's 29th Governor General in a ceremony which took place inside the Senate Chamber on Parliament Hill in Ottawa. The ceremony started at 10.55 a.m. local time. According to the press release, the ceremony was to be followed by military honours and the inspection of a guard of honour outside of Parliament (12.15 p.m.). 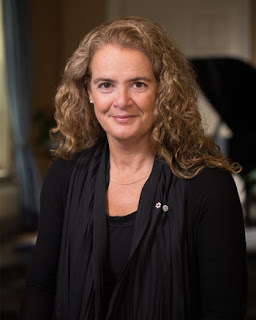 Ms. Payette will then lay flowers at the National War Memorial (1.45 p.m.), before arriving at Rideau Hall, the official residence and workplace of the governor general in Ottawa (1.55 p.m.). The day will conclude with an evening reception at the Canadian Museum of History (7 p.m.). Payette replaced David Johnston, who was installed as Governor General on 1 October 2010. Johnston bid farewell at a ceremony last Thursday. His term was originally meant to expire in 2015, but was extended with two years. Payette, b. 1963, is a businesswoman and a former astronaut and engineer. She has been married twice and has one son. In connection with Payette's installation, her coat of arms was unveiled. © The Office of the Secretary to the Governor General. Copy of the version at gg.ca. Arms: Per pale Azure and Sable a wing and in the canton the Royal Crown Argent. 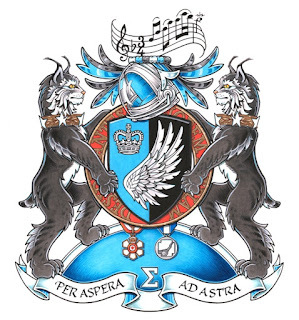 Crest: A musical stave bearing the first notes of the second movement of Alessandro Marcello’s Oboe Concerto in D minor Sable; Motto: PER ASPERA AD ASTRA, meaning “Through hardship to the stars”. Supporters: Two lynx Sable embellished Argent each wearing a collar set with laurel leaves Or and mullets Argent, and standing on the planet Earth Azure, its atmosphere Argent, charged with the Greek letter sigma (Σ) Argent. 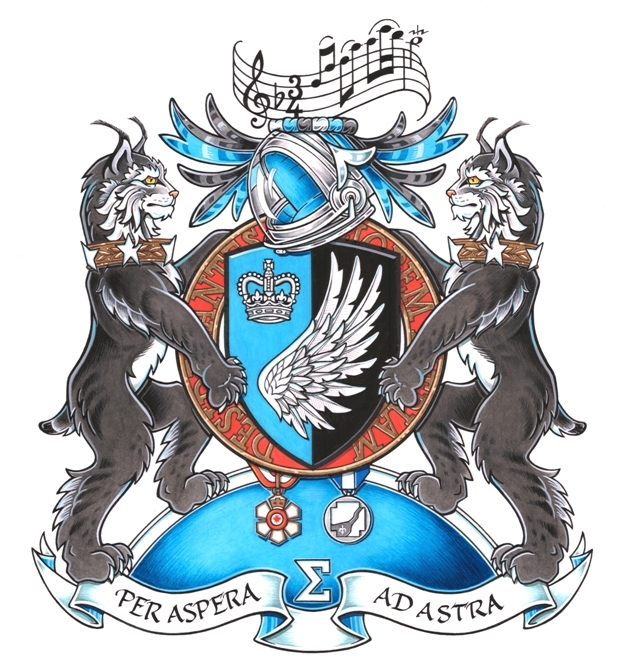 More information about the coat of arms can be found at the website of the Governor General's Office. The national coat-of-arms of Canada. Photo taken inside Parliament Hill in 2008. Rideau Hall, the official residence of the Governor General of Canada. Well, just to prove that I have been there! Last five photos: © 2008 Dag Trygsland Hoelseth. The Swedish Royal Court announced today that the christening of Prince Gabriel, second son of Prince Carl Philip and Princess Sofia, will take place in the Royal Chapel at Drottningholm Palace on Friday 1 December 2017. Prince Gabriel was born on 31 August 2017 at Danderyd Hospital. His name and title was announced on 4 September 2017. Prince Alexander, Prince Gabriel's elder brother, b. 19 April 2016, was also christened in the Drottningholm Palace Chapel (9 September 2016). Princess Madeleine and Chris O'Neills children, Princess Leonore, b. 20 February 2014, and Prince Nicolas, b. 15 June 2015, were christened at Drottningholm on 8 June 2014 and 11 October 2015 respectively. Crown Princess Victoria and Prince Daniel's children, Princess Estelle, b. 23 February 2012, and Prince Oscar, b. 2 March 2016, were on the other hand christened in the Royal Chapel at the Royal Palace in Stockholm. Princess Estelle's christening took place on 22 May 2012, while Prince Oscar's christening took place on 27 May 2016. Crown Prince Haakon and Crown Princess Mette-Marit of Norway are currently paying a county visit to Nord-Trøndelag. Today they arrived at the island of Jøa in the municipality of Fosnes, where they among others visited the childhood of the author Olav Duun (1876–1939). On the Royal Court's official website you will find will find an article about today's visit to Jøa as well as photos from the country tour. See also NRK.no. Duun was born at the farm Stein nearby, but lived at Øver-Dun farm at Ramnfjellaksla from he was 7-8 years old until he was 25. After he married Emma Møller (1881–1970) in 1908, he lived in Botne in Vestfold county (Botne became a part of Holmestrand municipality in 1964). He died in Tønsberg in 1939 and was buried at Dun Cemetery at Jøa near his childhood home. I visited Jøa and Olav Duun's childhood home two years ago. Here are some photos of the farm Øver-Dun and Dun Church and Cemetery. For no particular reason I never took photos of the entrance side of the house. But you you can see one photo of the Crown Prince couple in the door opening here. The Olav Duun memorial behind the farm house. From the back side of the headstone you can actually spot Olav Duun's childhood home. The first church at Dun was consecrated in 1900. It burnt down in 1944. The present church was consecrated 5 years later. All photos: © 2015 Dag Trygsland Hoelseth. During her new year's speech in 2015, Queen Margrethe announced that Prince Henrik had decided to retire from his official duties as of January 2016. A few months later he decided to stop using his title «Prince Consort» and reverted to being «just» Prince Henrik. On 3 August 2017 the Danish Royal Court informed that the prince had requested «not to be buried in Roskilde Cathedral as otherwise planned». The reason for his rather surprising decision was that he felt he was discriminated against because he had not received the title of king (consort) and thus felt he was not on equal foot with his wife the queen. Following the press release, he made comments to the media saying among others that the queen had made a fool of him. Prince Henrik has been occupied with the idea of being titled as king consort for quite some time, but his rather erratic behaviour in August made many observers feel that something was wrong with him. Although one could understand the reasoning behind his demands, his way of punishing his wife was uncalled for. In other words, today's press release doesn't come as a big surprise, and his health situation obviously explains his behaviour to a large extent. It is just sad that the court didn't protect him better back in August, and equally sad that the media didn't follow the Danish set of principles concerning press ethics, as it was obvoious to most people that the prince needed to be protected against himself. I also hope not only that the media now will respect Prince Henrik's need for peace and quiet, but also that the public will also remember his many years of tireless work for the good of Denmark. As far as I know no information has been revealed about the due date, but obviously the duchess is less than 12 weeks pregnant, so the baby will be born some time in the spring of 2018. The ducal couple's first child, Prince George, was born in 2013, while the second child, Princess Charlotte, arrived in 2015. Updated on Thursday 19 October 2017 at 10 p.m. (postscript added). In the Council of State held at Stockholm Palace today it was announced (*) that Prince Carl Philip and Princess Sofia's son, who was born on Thursday 31 July 2017, had received the name Gabriel Carl Walther. It was also announced his first given name Gabriel was to be his call name. He had also received the title Duke of Dalarna. When I commented on the name possibilities on Thursday, I said that everything was possible. That was why I argued, with my tongue in cheek, that Alfred was a good alternative for the newborn prince. It would go well together with his brother Alexander's name as well. I was certain, however, that Folke would be one of the names, as the three earlier princes of the present generation – Nicolas (Paul Gustaf), Oscar (Carl Olof) and Alexander (Erik Hubertus Bertil) – all had got one of their names from their grandfather King Carl Gustaf Folke Hubertus. But I was wrong on that as well. In the end no-one had guessed Gabriel for the baby prince's call name. No members of the Bernadotte family have the name Gabriel. But in the European Royal Family we have Prince Gabriel of Belgium – second child of King Philippe – and Prince Gabriel of Nassau, eldest son of Prince Louis. So in other words not a tradtional Swedish royal name, but something the parents opted out of personal preference. They might have felt that as Prince Gabriel was far down in the line of succession, they were less bound by tradition. Then again, Crown Princess Victoria and Prince Daniel were not so committed to royal traditions when they named their first child Estelle... Prime minister Stefan Löfven said that the prince «without any doubt was a little Gabriel», whatever he meant by that. Gabriel is a common name in Sweden, but not among the most popular names. According to Statistiscs Sweden, 341 boys received the name Gabriel last year, which resulted in a 42nd place. All in all 17 709 men in Sweden have the name Gabriel, while 10 297 men has Gabriel as their call name. It should be added that there have been a few surprises earlier as well. Just think about Prince Sigvard and Prince Lennart. The name Gabriel, even though it is not a traditional Swedish royal name, will work well, and it goes well together with Alexander too, I think. The second name Carl is of course a very popular royal name in Swedish history. It is part of the current king's name, and is also the second name of Prince Gabriel's first cousin Prince Oscar. The third name Walther obviously comes from Queen Silvia's father Walther Sommerlath (1901–1990). One of her brothers also has the name Walther. Many had guessed that Prince Gabriel would receive the ducal title of Dalarna, because his mother Princess Sofia grew up there. Then again, so did many before Prince Alexander's title was announced. As Trond Norén Isaksen pointed out in his blog article today, it was actually «the first time that such personal connections are taken into consideration for the choice of dukedom». Isaksen wrote, by the way, an excellent article on Swedish Royal Dukedoms in Royalty Digest Quarterly no. 2, 2016. Prince Gabriel is the third member of the Bernadotte dynasty to receive the title Duke of Dalarna. Previous dukes of Dalarna were Prince August (1831–1873) and Prince Carl Johan (1916–2012) until he lost his titles in 1946. (*) English version of the announcement. Updated on Tuesday 5 September 2017 at 09.30 (subject title standardization). Just like when Prince Alexander and Prince Nicolas (the second child of Princess Madeleine and Chris O'Neill) were born, midwife Anna Ståhl and birth doctor Sophia Brismar Wendel assisted the birth. The newborn prince is no. 6 in the line of succession to the Swedish throne, after his brother Prince Alexander, but before his aunt Princess Madeleine. The prince is King Carl Gustaf and Queen Silvia's fourth grandson and sixth grandchild. The happy event was marked by a salute – 21 shots – from the salute stations in Boden, Härnösand, Karlskrona and Gothenburg at 6 p.m. The court has also informed that a Council of State, in which the name and ducal title will be announced, and a service of thanksgiving («Te Deum»), will take place on Monday 4 September 2017 at the Royal Palace. The name guessing has of course already started. It has been rather difficult to predict the names of the royal babies in Sweden. Prince Oscar, the son of Crown Princess Victoria and Prince Daniel, was perhaps the exception. So it is not easy to say what to expect. Everything is possible! I have said many times before that my personal preference would be a traditional Swedish royal name – and now I am first of all thinking about the name to be used daily – or at least a traditional European royal name. Alternatively a name with Swedish/Norse roots. So I was actually quite pleased with choice of the name Alexander for Prince Carl Philip's eldest son. I have read that many have mentioned William – or Wilhelm – as a possibility. I agree that the name would go well together with Alexander. In the Facebook group Royalty Digest Quarterly I suggested – just for fun, mind you – the name Alfred and the ducal title Dalarna. At least Alfred, Duke of Edinburgh, was a distant relative of the newborn baby. And I think Alfred would go well with Alexander. I am confident, however, that I will be wrong on at least one of the guesses, probably on both accounts. What about the other names? An interesting point, as made by Robert Warholm at the Facebook group Kungligt forum back in 2016, is that the three earlier princes Nicolas (Paul Gustaf), Oscar (Carl Olof) and Alexander (Erik Hubertus Bertil) all have got one of their names from their grandfather King Carl Gustaf Folke Hubertus. So I think that we can expect Folke as one of the given names. Princess Sofia's grandfathers were named Stig and Janne Herbert, just to mention it. So, how about Alfred Wilhelm Herbert Folke?! HRH Princess Madeleine and Mr. Christopher O'Neill are delighted to announce that The Princess is expecting their third child. The Princess is feeling well and the birth is expected to take place in March 2018. The couple's first child, Princess Leonore, was born in New York City on 20 February 2014. The second child, Prince Nicolas, was born on 15 June 2015. Prince Carl Philip and Princess Sofia are expected to become parents again for the second time in September, which means that the March child will become King Carl Gustaf and Queen Silvia's seventh grandchild. In other words, the Swedish royal house is blessed with many princes and princesses. The king has decided that all his grandchildren will receive the title of Prince or Princess as well as a ducal title. In the next generation I expect that the royal titles will be reserved for the grandchildren of Crown Princess Victoria. Sist søndag kveld skrev jeg en kort bloggartikkel etter besøket mitt på Alfaset gravlund i Oslo tidligere på dagen. Under besøket passerte jeg gravfeltet til romslektene i Norge og oppdaget at graven til Marina Jansen var blitt utsatt for hærverk. Jeg har siden forsøkt å få klarhet i når dette kan ha skjedd, men har ikke fått noen svar. Jeg nevnte at også Karoli-graven på Vestre gravlund var blitt utsatt for hærverk ved minst et par anledninger, og at jeg kanskje ville komme tilbake til dette ved leilighet. Her følger noen bilder fra Vestre gravlund tatt med års mellomrom samt bilder fra Alfaset gravlund tatt i 2016 og i dag. 01. Graven til Polykarp og Lola Karoli, Vestre gravlund, Oslo, august 2005. 02. Graven til Polykarp og Lola Karoli, Vestre gravlund, Oslo, august 2005. 03. Graven til Polykarp og Lola Karoli, Vestre gravlund, Oslo, april 2007. 04. Graven til Polykarp og Lola Karoli, Vestre gravlund, Oslo, mai 2015. 05. Dronningkrone skal det være! Graven til Polykarp og Lola Karoli, Vestre gravlund, Oslo, mai 2015. 06. Graven til Polykarp og Lola Karoli, Vestre gravlund, Oslo, juli 2017. 07. Graven til Polykarp og Lola Karoli, Vestre gravlund, Oslo, juli 2017. 08. Graven til Polykarp og Lola Karoli, Vestre gravlund, Oslo, juli 2017. 09. Malepenselen lå igjen etter gravskjendningen på graven til Polykarp og Lola Karoli, Vestre gravlund, Oslo, juli 2017. 10. Graven til Milos og Lisa Jansen, Alfaset gravlund, Oslo, april 2016. 11. Graven til Milos og Lisa Jansen, Alfaset gravlund, Oslo, april 2016. 12. Graven til Milos og Lisa Jansen, Alfaset gravlund, Oslo, 12. juli 2017. 13. Graven til Milos og Lisa Jansen, Alfaset gravlund, Oslo, 12. juli 2017. 14. Graven til Marina Josef, Alfaset gravlund, Oslo, 12. juli 2017. 15. Navneplaten på graven til Marina Josef, Alfaset gravlund, Oslo, 12. juli 2017. 16. Gravplaten på graven til Marina Josef, Alfaset gravlund , Oslo, 12. juli 2017. 17. Graven til Frans Josef (1919–1989), Alfaset gravlund, Oslo, 12. juli 2017. Den såkalte sigøynerdronningen, Lola Karoli, f. 1929, døde i 1996 og ble gravlagt på Vestre gravlund i et eget gravkammer. Ifølge romfolkets gravtradisjon kan ikke kisten berøre jord og derfor har romfolket fått tillatelse til å bygge egne gravkamre. Lolas ektefelle, Polykarp Karoli, på gravplaten (se for eksempel bilde 02), stod det forresten Polikina, døde i 2001 og ble gravlagt samme sted. Man kan se bilder fra begravelsen blant annet i en reportasje TV2.no skrev etter gravskjendingen i 2010. Lola og Polykarp var forresten folkeregistrert under navnene Eva og Pål Karlsen, jf. Gravferdsetatens offentlige register (Begravdeioslo.no). Under studietiden jobbet jeg en sommer som gartner på Vestre gravlund, men det var før Lola Karoli døde. Senere har jeg besøkt gravlunden med jevne mellomrom for å ta bilder for diverse slektsartikler og andre slektsforskningsprosjekter, samt for å besvare såkalte «photo requests», bildeønsker, på nettsiden Findagrave.com. Jeg har derfor passert og/eller stukket innom Karoli-graven flere ganger. Natt til 17. mai 2010 ble gravmonumentet utsatt for hærverk. Som man kan se av TV2.no's reportasje ble «gravhodet» revet over ende og tilsølt med maling. Ifølge reportasjen skal et motiv for udåden ha vært at «gravrøvere ville plyndre sigøynerdronningen», ettersom ryktet gikk på at Lola «skal ha hatt gull og diamanter for mellom to og tre millioner kroner i kisten da hun ble gravlagt». Jeg er nok litt skeptisk til disse påstandene, men når noe blir gjentatt ofte nok, ender de som regel opp med å bli en vedtatt sannhet. Den eller de som stod bak gravskjendingen lyktes ikke i sitt forehavende, men sørget altså for betydelige ødeleggelser. «Romfolket mener å vite hvem som står bak gravskjendingen – en tidligere straffedømt mann som tilhører en konkurrerende romfamilie», kunne TV2.no fortelle. Om dette gjaldt et medlem av Jansen-familien, dvs. etterkommere etter Polykarp Karolis yngre bror Milos Jansen (1928–2001), eller et medlem av Josef-familien, har jeg ikke fått klarhet i. Konfliktene, som flere ganger har utartet seg til voldelige sammenstøt mellom de nevnte familiene, har som kjent pågått i mange år. Når det gjelder gravmonumentet, så passerte jeg det under minst ett gravlundsbesøk mens gravhodet fortsatt lå ved siden av, men jeg tok dessverre aldri bilde av det. Bildene tatt i 2015 dokumenterer i hvert fall at fotoet av Lola Karoli, fotoet av Polykarp Karoli og et fellesfoto var borte, det samme var gravplaten med navnet til Polykarp. Som overhode for Karoli-familien var han en omstridt person, og man tenkte kanskje at det å fjerne navneplaten ville virke preventivt. 16. juni 2017 ble gravmonumentet utsatt for hærværk nok en gang, noe både NRK.no/Østlandssendingen og Aftenposten har skrevet om. Jeg tok bilder av gravmonumentet i går. Som man kan se lot gjerningspersonene malepenselen ligge igjen. Ifølge en representant for Jansen-familien skal hærværket ha vært en hevnaksjon for at farens gravstein var blitt tauet bort. Han vistge altså til gravmomumentet til Milos Jansen på Alfaset gravlund. Jeg må innrømme at jeg ikke la merke til at noe hadde skjedd med Jansen-graven på Alfaset da jeg besøkte gravlunden sist søndag, mest fordi gravskjendingen av Marina Josefs grav var så iøynefallende. Jeg besøkte Alfaset igjen onsdag ettermiddag og så nå at gravhodet var blitt revet ned, men det skulle ikke være noe stort problem å få det på plass igjen. Jeg vet ikke når dette bortauingsforsøket fant sted, men antar at det skjedde i våres en gang. Bilde 10 og 11 over viser hvordan gravmonumentet så ut i april 2016. Den gangen var det faktisk et gravhode tilhørende et annet medlem av Jansen-familien som var blitt revet ned, men jeg lar det ligge nå. Jeg vet fortsatt ikke hva som ligger bak gravskjendingen av Marina Josefs grav. Det kan godt tenkes at også hun var blitt utsatt for en hevnaksjon som følge av konflikten(e) mellom familiene, men slik jeg har forstått hadde det ikke sammenheng med den pågående konflikten mellom Karoli- og Jansen-familiene. Kanskje vi får vite mer etter hvert. Noen har besøkt Josef-graven etter at jeg skrev om gravskjendingen søndag, for da jeg var der onsdag ettermiddag var det delvis ryddet opp. Så får vi håpe at familiene nå besinner seg. Det er ille nok at de har latt stridighetene pågå i så mange år, men det er uverdig at de også skal gå løs på gravminnene. Det må det bli slutt på! Postskript 13. juli 2017 kl. 19.05, endret 14. juli 2017 kl. 09.55. Diverse søk på ulike nettsider og sosiale medier har ledet meg til å tro at hærverket som gravmonumentet til Marina Josef er blitt utsatt for må ha skjedd nokså nylig, kanskje så sent som lørdag kveld. Man kan ellers undre seg litt over at gravskjendingen ikke har fanget nyhetenes interesse på samme måte som tilsølingen av Karoli-graven på Vestre gravlund gjorde, men nå er det vel så at Karoli-slekten er bedre kjent i norsk media enn Josef-slekten, og Vestre gravlund er litt nærmere «begivenhetenes sentrum» enn det Alfaset gravlund er. De tre største norske romslektene – Karoli, Jansen og Josef (Karoli og Jansen utgår fra to brødre, så de kan også regnes som én slekt) – teller rundt 5–600 medlemmer (jeg har også sett tallet 800), så det er ikke like enkelt å få god nok oversikt over familiene. Det gjør det heller ikke lettere at de norske romer ofte opptrer med forskjellige navn – de folkeregistrerte navnene er ikke nødvendigvis de samme som de bruker innad i miljøet, og i tillegg kommer eventuelle kallenavn. Polykarp Karoli var folkeregistrert som Pål Karlsen, og mange medlemmer har skiftet folkeregistrerte navn én eller flere ganger. Den avdøde Čugurka Karoli, broren til Polykarp og Milos, hadde barn med helt andre etternavn. Med andre ord, det er ikke lett å plassere Marina Josef, og uten godt nok kildebelegg vil jeg ikke spekulere for mye utad, men jeg kan ikke lenger si at det er umulig at gravskjendingen av Marinas grav ikke hadde forbindelser til tilsølingen av Karoli-graven. Når det gjelder gravskjendingen på Vestre gravlund i 2010, så skrev TV2.no vel 3 år senere at hærverket ikke hadde angivelig nedgravne edelstener som motiv, men skyldtes konflikten mellom Karoli- og Josef-slektene. Oppdatert torsdag 13. juli 2017 kl. 13.30 (et par, tre ortografiske feil); torsdag 13. juli 2017 kl. 19.05 (postskript); sist gang fredag 14. juli 2017 kl. 09.55 (retting av ortografisk feil, tilføyelse av avsnitt).